^ Taleb, Nassim Nicholas (November 15, 2016). "Incerto: Fooled by Randomness The Black Swan The Bed of Procrustes Antifragile". Random House Trade Paperbacks. Retrieved November 5, 2017 – via Amazon. ^ Taleb, Nassim Nicholas. "Opacity: What We Do Not See". Fooledbyrandomness.com. Retrieved October 1, 2010. ^ Nassim Nicholas Taleb. "Abbreviated List of Factual and Logical Mistakes in Gregg Easterbrook's Review of The Black Swan in The New York Times" (PDF). Fooledbyrandomness.com. Retrieved November 5, 2017. ^ Foden, Giles (May 12, 2007). "Stuck in Mediocristan". The Guardian. Retrieved January 7, 2015. ^ "Charlie Rose Talks to Nassim Taleb". Bloomberg.com. February 24, 2011. Retrieved November 5, 2017. ^ Taleb, Nassim Nicholas (May 11, 2010). 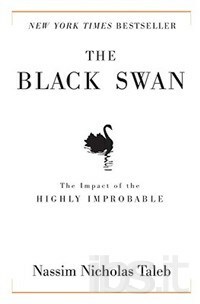 "The Black Swan: Second Edition: The Impact of the Highly Improbable: With a new section: "On Robustness and Fragility"". Random House Trade Paperbacks. Retrieved November 5, 2017 – via Amazon. ^ Taleb, Nassim Nicholas (November 1, 2010). "Benoît Mandelbrot". Time. Retrieved November 5, 2017.